With Me Little Ukulele in Me Hand! No recording date(s) or location(s) given. Every Upbeat CD that I have received for review to date has been a jazz disc, but this is not one of these even though all of the performers on it have strong jazz connections. 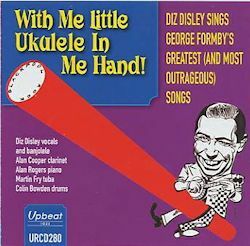 While it is true that just about any piece of music can be given a jazz rendition, I’m not sure that that which appealed to George Formby could be—at least successfully—given such, and if so, then this is not it. No attempt is made to play the pieces as jazz, despite the assemblage of jazz musicians. That is not to say it is badly done—it attempts, and quite well, to be faithful to the music hall tradition in which Formby was steeped. It is, however, something of an acquired taste, I would guess; so those coming to Formby for the first time may be a bit nonplussed. is usually depicted playing the ukulele, but he did also play the banjolele. Disley does not try to copy Formby, but does try—and succeeds—to elicit the flavor of Formby, singing the songs written by or associated with Formby, many of them having a touch of double entendre and including some of the little Formby trademarks—the spoken portions, the voice inflections and the English north country pronunciations, the sly chuckle here and there. Strangely enough, one of Formby’s best known songs is not included—Leaning on a Lamp Post. But the others are all vintage Formby. Formby often performed with an orchestral backing, just as Disley does here, although his “orchestra” is fairly small. Some of the different instruments are hard to detect, particularly the piano and drums. The latter are perhaps most audible on Grandad’s Flannelette Nightshirt, but Bowden is either playing wood blocks or wash board there, I can’t be sure which. So all devotees of English music hall and/or George Formby have a treat awaiting them here. With eyes closed and player volume at a comfortable level, one may be transported back to any time from the twenties through the fifties—actually until his death in 1961—when Formby was performing to considerable acclaim on both stage and screen. And one will easily see in the mind’s eye his toothy grin and cheeky smile as he sang and strummed.